Beijingers rise with the sun, slowly ride their bicycles to the only places where nature still rules – the parks – and practice the ancestral movements of Taiji. 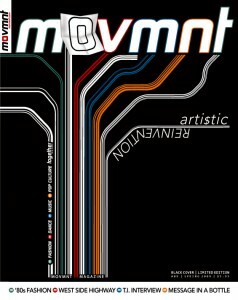 First letter from the editor of movmnt magazine, David Benaym, written as mission statement for movmnt with a vision where our future determine today’s actions. Utterly lovely, songstress Kate Havnevik has made quite an impression on the producers of Grey’s Anatomy who can’t get enough of her haunting melodies. Danny Tidwell has a conversation with his mentor Desmond Richardson and his mother and dance teacher, Denise Wall. Trained in Virginia Beach at his mother’s studio, Denise Wall’s Dance Energy, he found his first moment of fame at the age of nine… Portrait of Travis Wall. Daniel B. Quinones here to tell you about my pimped-out kicks. Well, it all started by browsing the net for kicks that were unique and had style.